Posted 4/19/2019 6:28pm by Leslie Cooperband or Wes Jarrell. In my self-proclaimed tradition of reflecting on Earth Day from a farmer’s point of view, I’ve decided to write about the current language around food and farming this year. There’s an ever-growing chasm between those who raise food and those who consume it, leaving those who consume at the mercy of the food labelers and marketers to provide context for food purchasing decisions. The folks in the middle of the food chain have become the translators. They often use words and images to evoke a 19th century picture of farming: farmers toiling the land with small machinery, growing and harvesting the crops themselves, raising their livestock on pastures, letting their chickens run around the yard. The intent is to assure consumers that these products are wholesome and healthful, raised with care and kindness. Yet the words and images don’t usually mesh with the reality of our large-scale industrialized food system. If consumers try to verify these claims, they hit a wall of privacy or are led to opaque websites with scant information about the actual farms. Contrast this scenario with the language of direct market farmers. Their signs are often hand-written, their products sometimes imperfect, their words often scant, letting the products speak for them. They grow varieties that don’t ship well, they pick fruits closer to their peak ripeness, they raise their livestock on a small scale, allowing the animals to express their true natures. They don’t spend much money on slick labels; they want to engage their customers in direct conversations. They want to tell folks what’s tasting really good right now, they want to show patrons pictures of their prized pig or their champion chicken. The length of their food chain is typically two to three people deep. Theirs is the language of flavor, of color, of health, of sensory excitement. On the eve of Earth Day, as we contemplate our relationship to our planet, consider your own food dialect and try learning the language of your local farmers. Chef Raquel keeps upping her culinary game. This Saturday’s brunch menu looks amazing and features so many great local farms and food artisans. Be sure to get here early so you can sample as many of the menu items as possible. Remember: Saturday, the farm is open 10 AM to 2 PM. You can visit with the goats, see the babies and enjoy brunch. Parking is limited due to continued wet and soggy ground. We encourage our guests to carpool. New this year-if you have 4 or more people in your car you can park for free! Fewer than four? We are requesting a $5/car donation (this is not mandatory, but with the extremely wet weather we’re experiencing this spring, our parking spaces are quite limited). Delight Flower Farm will be here doing another Pop-Up Flower Shop in front of our barn. Cow Creek Farm will be here selling ramps (wild-harvested from their farm’s woodlands near Paxton IL)-ramps are wild leeks that emerge from forest soils before the trees have a chance to leaf out. They have a very short season, and their flavor is beautifully complex—onion x leek x garlic. We can’t stop making this special spring flavor of chevre because we can’t stop eating it ourselves: Chevre with Fresh Chives and Lemon Zest. -locally milled flours from Janie’s Mill AND MORE! In addition to “Babies & Brunch,” the farm will be open on Sunday from 1-4 pm. If you’re looking for a fun activity to take your holiday guests to between meals, take them to the farm on Sunday afternoon. Although we won’t be offering brunch service, you can “Build your own Cheese Board” with wine/beer, peruse the farm store and visit with the goats-young and old. We’re now taking reservations for our Mother’s Day Brunch Buffet. We have two seatings—10 am to 12 noon and 12:30-2:30. Check out the amazing menu that Chef Raquel has crafted and book your reservations NOW. Seats are going fast. I’ve posted a bunch more of the farm dinner themes and dates on our website and our ticket sales page (ShowClix), so check them out and make some reservations. These tickets go fast. Yoga with Goats Maggie Taylor, owner of Delight Flower Farm, will once again be offering goat yoga this spring. She has posted a number of dates with ticket sales in progress. Several dates are already sold out! This playful take on yoga practice will surely delight—check out the dates and book your reservations now. CSA sign up through Blue Moon Farm! Blue Moon Farm is offering a new customizable CSA (Community Supported Agriculture for those unfamiliar). They are partnering with a number of other local farms (including ours) to offer “add-ons” in addition to their weekly vegetable shares. The customizable CSA puts you in charge of deciding what products you want and when you want them. They have multiple pick up locations too! Their season starts some time in May, so don’t delay in signing up for a one-stop shop of some of the best local food in Central IL. Posted 4/11/2019 9:45pm by Leslie Cooperband or Wes Jarrell. There’s a vibrant color that now carpets the land around the farm. It’s a color we haven’t seen around here for too long a time; the color green. Perhaps I’ve been so consumed by cheese making this spring that I didn’t notice the transformation. The monochromatic schema of browns and greys suddenly has given way to Technicolor splendor. There are other signs as well: the rhubarb leaves have popped out of the ground, hiding their ruby stocks below. A small flock of egrets circled overhead the barn this afternoon, appearing to engage in a courtship ritual. The hum of the trilling toads crescendos in the evening air over the pond, evidence of amphibian love songs and tadpoles to come. We are beginning the second wave of kidding, this time mostly the first-time mothers. As they move from yearlings to new mothers, they seem perplexed by their transformation. Their instincts and their hormones command them to undergo the pains of labor, only to deliver new life that they resist claiming as their own. It takes some coaxing to get them to clean off their newborn kids. They act so surprised that this wet and slimy being has emerged from their own being. Reluctantly, they begin to take ownership and move toward the next phase of their lives as mothers, as milkers. Second Week of Full Menu “Babies & Brunch” with Chef Raquel Ritz Chef Raquel is planning to hit it out of the culinary ballpark again this Saturday. Check out her menu and plan to get here early to make sure we don’t run out of your favorite items. Remember: Saturday, the farm is open 10 AM to 2 PM. You can visit with the goats, see the babies and enjoy brunch. Parking is limited due to continued wet and soggy ground. We encourage our guests to carpool. New this year-if you have 4 or more people in your car you can park for free! Fewer than four? We are taking a $5/car donation. In addition to “Babies & Brunch,” the farm will be open on Sunday from 1-4 pm. Although we won’t be offering brunch service, we’ll be featuring Lucky Pierre bagels and chevre. You can also “Build your own Cheese Board” with wine/beer, peruse the farm store and visit with the goats-young and old. We’re now taking reservations for our Mother’s Day Brunch Buffet. We have two seatings—10 am to 12 noon and 12:30-2:30. Check out the amazing menu that Chef Raquel has crafted and book your reservations NOW. Don’t forget to sign up for a farm dinner. I will be adding more dates and themes in the next week or so, but the tickets already for those already on sale are going fast. Posted 4/5/2019 9:10pm by Leslie Cooperband or Wes Jarrell. When we planned last fall’s breeding season to freshen over 50 does in less than three weeks, we thought mostly about minimizing the sleepless nights delivering babies and fretting over laboring mothers. We thought less about the consequences of exponential milk growth in the bulk tanks. The upshot has been a brisk transition from one or two batches of cheese per week to cheese makes every day. I confess that the Maserati speed has been a bit jarring to my aging body. My existence is now tuned to the whims of the precious white fluid: pump milk, pasteurize milk, culture milk, ladle curd, wash dishes, scrub floors and repeat. The intensity of the routine leaves little time for reflection; the curd waits for no one. As the progression begins to congeal into familiar patterns, I take comfort in the certainty of repetition. There is beauty in the movement of the ladle and the sound of curd plopping gently into cheese cloth. There is satisfaction in the gleam of a well-cleaned cheese vat. There is pride in reconnecting with the deliciousness of fresh spring chevre. Chef Raquel is back in her culinary saddle this week as we launch the April Full Menu “Babies and Brunch.” She has pulled out all the stops for the first menu. You can get all the details, including this week's menu HERE. Remember: Saturday, the farm is open 10 AM to 2 PM. You can visit with the goats, see the babies and enjoy brunch. Parking is limited due to continued wet and soggy ground. We encourage our guests to carpool. New this year-if you have 4 or more people in your car you can park for free! Fewer than four? We are taking a $5/car donation. Delight Flower Farm will be here doing a Pop-Up Flower Shop in front of our barn. In addition to “Babies & Brunch,” the farm will be open on Sunday from 1-4 pm. Although we won’t be offering brunch service, you can still “Build your own Cheese Board” with wine/beer, peruse the farm store and visit with some of the goats (the barns will be closed, but we’ll have a pen with babies set up outside so you can get your fill of those jubilant beings). 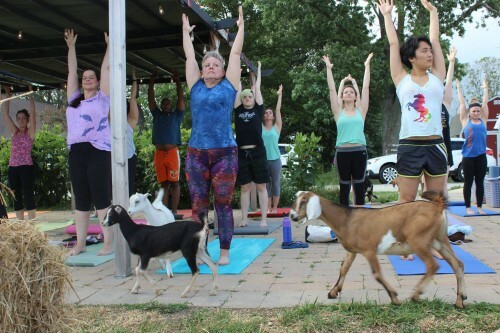 Maggie Taylor, owner of Delight Flower Farm, will once again be offering goat yoga this spring. She has posted a number of dates with ticket sales in progress. This playful take on yoga practice will surely delight—check out the dates and book your reservations now. Posted 3/30/2019 8:58am by Leslie Cooperband or Wes Jarrell. I'm very sorry to announce that the farm is flooded from all the rain we've had over the past 12 hours. We will NOT be open at the farm today. AND--a little pen of baby goats! Stay dry and come see us at the Coop today. The farm will be open tomorrow (Sunday) for regular store hours (1-4 pm), and limited walking around the farm. The ground is so saturated with water, we are NOT able to park many cars. Baby boom, the start of the new season, first "Babies & Brunch," and More! Posted 3/28/2019 10:39pm by Leslie Cooperband or Wes Jarrell. Over 100 kids on the ground in less than three weeks’ time: a continuous stream of birth and renewal of milk and cheese on the farm. The transformation from stillness and quiet to the moans of labor and the cries of newborns as they take their first breaths never ceases to astound me. Adrenaline is a dairy farmer’s aid during kidding season. Our reactions to the signs of labor have become instinctual. We done our gear grab our labor and delivery box (equipped with OB gloves, betadine, lube and fresh clean towels) and head to the doe barn as the stages of active labor ensue. The does usually separate themselves from the rest of the herd as they sense the onset of labor. They paw at the ground, moving the straw just so to create the perfect nest in which to lie for delivery. They arch their backs, yawn, and get up and down repeatedly, all in an effort to position their kids for delivery in the birth canal. As they enter the final stages of labor, they start to push. We look for the birth sack and the first signs of hooves. If the head doesn’t follow right away, we wait a little longer. We like to encourage our does to do most of the work in delivering their kids, but sometimes they need some assistance. We’ve had a lot of very big kids born this year; the bigger the kids, the more likely they are to get stuck in the birth canal or come out backwards. I spring into action as goat midwife: OB gloves, lots of lube and a few drops of betadine and in I go in search of the right body parts. If I find legs, I reach back to find the head attached to those legs. Sometimes, two kids are trying to exit the birth canal at the same time, making it tricky to make sure the legs I am pulling are attached to the right body. Eventually, the body parts are sorted out, the head is straightened and the front legs move forward to dive into the new world. The new mother relaxes as the pressure and pain subside. The other newly freshened mothers gather around the baby to help clean off the birth fluid. Despite her maternal instincts, the new mother allows her herd mates to share in the ritual of welcoming the newborn kid into their communal world. 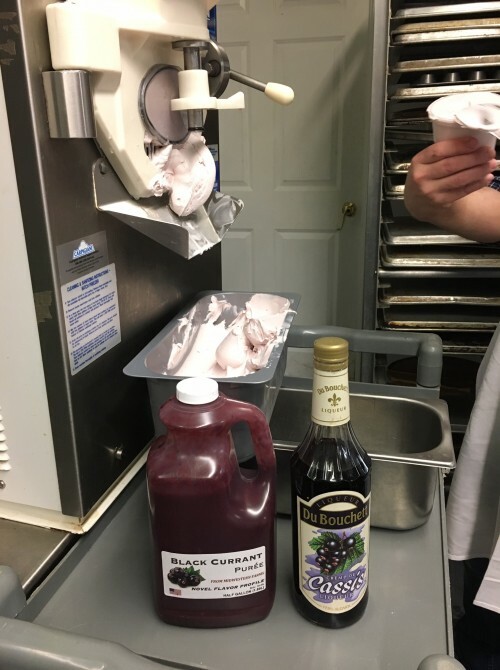 Once there was sufficient milk free of colostrum to collect for cheese making and gelato production, we sprang into action in the creamery. Like bees cleaning their hives after a long and messy winter, we got to work scrubbing and washing, soaking and sanitizing, putting the shine back on the cheese vats. In one week, we’ve already made three batches of chevre and a batch of gelato base. We’ll have fresh coffee from Columbia Street Roastery and our famous goat milk hot chocolate. Posted 3/8/2019 7:43pm by Leslie Cooperband or Wes Jarrell. The baby births are on slow burn as February fades into March. While we’re anxious to get the season underway, we’re secretly happy for the glacial pace. The longer they delay, the more likely winter will make its seasonal retreat from our landscape. The goats can almost taste the hint of warmer temperatures in the humid air. Our second doe to kid this season dropped two beautiful bucklings this morning. Several of her barn mates are putting themselves in delivery states of mind. The nights of sleep deprivation loom happily on the horizon. The farm is open for visitors Saturday and Sunday, March 9th and 10th, 11-3 each day. Come see the very pregnant goats and maybe even catch a glimpse of the newest babies. Come inside the farm store, The Real Stand, to buy some cheese! NEW in the store: Piemonte Sausage Co. of Urbana is now making charcuterie! We have their pancetta and pork lomito available. Claude and Susan, the owners of Piemonte, went to Italy last fall to learn the craft of salumi making. These products are authentic and delicious! Give them a try. We also have frozen sausages from Piemonte Sausage Co. and meats/poultry and eggs from Bane Family Meats. 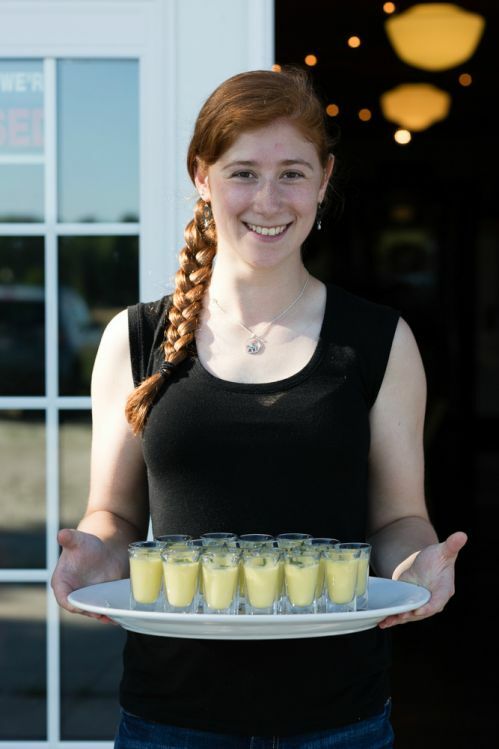 The Prairie Fruits Farm “Milk Bar” will be open, serving espresso drinks and cow milk hot chocolate. We’ll have a few baked goods from Central IL Bakehouse OR, stay awhile and enjoy a cheese board with baguette and a glass of wine or beer. PLEASE NOTE: The farm will be closed the weekends of March 16/17 and 23/24 as we get things ready for Babies & Brunch starting March 30th! Babies and Brunch Season will be here soon! 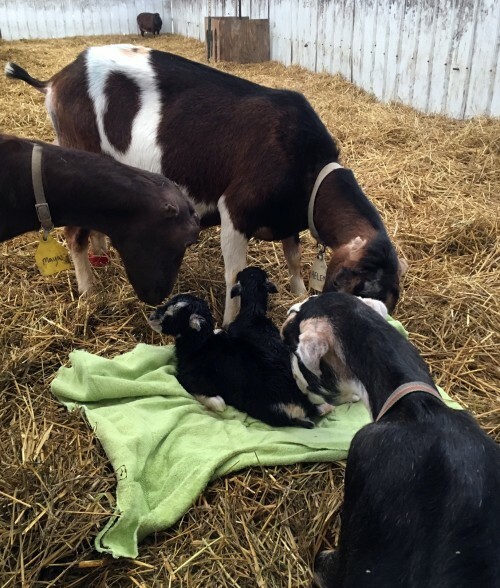 The arrival of baby goats at Prairie Fruits Farm & Creamery means one thing to many of our patrons: the return of “Babies and Brunch.” This year, our season kicks off on Saturday March 30th with pastries and baked goods from Lucky Pierre Bakers. Chef Raquel Ritz will take over the culinary helm in April with her pop-up café style menu. Details and menus are forthcoming, but mark your calendars NOW. The farm store will be open every weekend starting March 30th, both Saturdays and Sundays, but hours and offerings will differ for each day. Saturday hours March 30th through April 27th: 10 AM to 2 PM, Sunday hours, March 31st through April 28th: 1-4 PM. We have decided to forgo our cheese and gelato CSA this year, so that we can focus our attentions on bringing you delicious cheese and gelato to the Urbana Farmers’ Market and to offer it to you in our farm store, The Real Stand. That said, we will be participating in Blue Moon Farm’s new multi-farmer, customizable CSA program. The link is now open and ready for folks to add on our cheese share (two options) as part of the Blue Moon Farm veggie CSA. Hard to believe that winter will depart and spring and summer will push their way onto the farm. Start planning your special evenings at the farm by booking a dinner. If you’re not familiar with how our dinners work, check out our “Dinner Basics” page. If you’re a regular and you want to dive right in, go to the “2019 Season” page. We have a fantastic line up of chefs and themes so far, with more in the planning. One dinner (July 6th with Stephanie Izard) is already sold out, but we still have plenty of seats open for most of the posted dinners. We will be adding more dates and themes within the coming week too. We are excited to host you all again and to ignite the magic around good food and great company. Posted 2/21/2019 10:03pm by Leslie Cooperband or Wes Jarrell. The dull light, the pervasiveness of gray, the clingingly cold humid air, the lifeless frozen ground; all bespeak the persistence of winter. The star rodent who dwells in Pennsylvania predicted an early spring, but he must have received a bum tip from his handlers. Having come to trust in the ground hog’s prognostications, I feel somewhat betrayed. The standing pools of partially frozen water and the mud that clings to our dog Blue’s undercarriage suggest that spring, like me, has decided to sleep in a little while longer. The goats show no interest in venturing outside, content to burrow a little deeper in their straw bedding to stay warm. There swelling bellies and voracious appetites underline the urgency of moving forward despite winter’s lingering grip. We have started to clean out the kid barn, to wash the baby bottles and set up the new born totes. The births are insensitive to the weather; they will come when it’s time, snow squalls or not. The inevitability of the change of seasons gives me hope. Sleep deprivation awaits me in the near future. This is your last chance to take your guess at which doe will give birth first! Pick a doe, a date and the number of kids for a chance to win a free Prairie Fruits Farm t-shirt. While you’re visiting, venture into the Farm Store for a cheese board and glass of wine or beer or just curl up in a comfy chair and read a book or magazine. The farm store will have a limited repertoire of cheese for sale, as well as other products (meats, eggs, sausages, locally milled flour, honey, jam, PFF& C “merch”) and more! 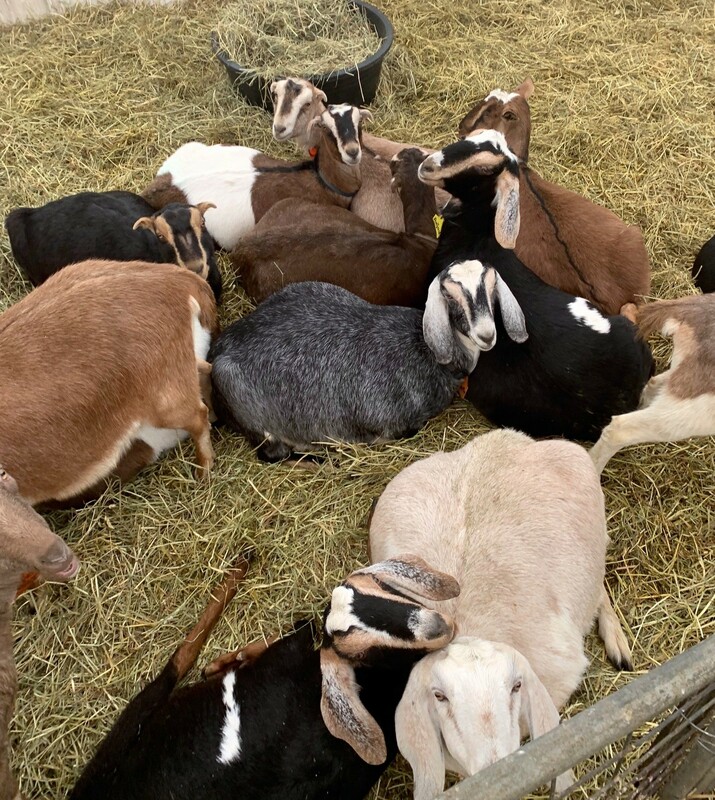 The arrival of baby goats at Prairie Fruits Farm & Creamery means one thing to many of our patrons: the return of “Babies and Brunch.” This year, our season kicks off on Saturday March 30th with pastries and baked goods from Lucky Pierre Bakers. Chef Raquel Ritz will take over the culinary helm in April with her pop-up café style menu. Details are forthcoming, but mark your calendars NOW. The farm store will be open every weekend starting March 30th, both Saturdays and Sundays, but hours and offerings will differ for each day. We have decided to forgo our cheese and gelato CSA this year, so that we can focus our attentions on bringing you delicious cheese and gelato to the Urbana Farmers’ Market and to offer it to you in our farm store, The Real Stand. That said, we will be participating in Blue Moon Farm’s new multi-farmer, customizable CSA program. Details and sign up opportunities are in the works. What better way to encourage winter to be on its way than to plan for our summer-fall farm dinner series. We’ve been communicating with a number of chefs this winter, some familiar favorites and some new, and we are excited to launch the sale of tickets for many of the dates this season. Ticket sales begin on Friday, February 22nd at 10 AM. If you’re not familiar with how our dinners work, check out our “Dinner Basics” page. If you’re a regular and you want to dive right in, go to the “2019 Season” page. We have a fantastic line up of chefs and themes so far, with more in the planning. We are excited to host you all again and to ignite the magic around good food and great company. Feeding shifts are 7-8 AM, 12-1 PM and 4:30-5:30 PM, 7 days a week from mid-March through mid-May. We are hosting a mandatory volunteer orientation this Sunday, February 23rd from 3-4 pm. If you want to help feed baby goats, you must attend this meeting. Posted 1/24/2019 9:08pm by Leslie Cooperband or Wes Jarrell. Once again, the winter weather has conspired against us. Due to extremely dangerous icy conditions at the farm, we will not be open this weekend for our "dote on the does" activities. The farm store will not be open either. We apologize for having to cancel our winter open hours, but we are concerned for the safety of our patrons and our staff. Stay tuned for future postings about the next opportunity on February 9th and 10th. Keep warm.